Do you want to create a slideshow out of some photos or images, but don’t seem able to get it to look or feel the way that you want? As you may be starting to realize compiling a slideshow is one thing, but using audiovisual elements to make it stand out and look great requires the right software. While there are numerous options out there that you could try, you should definitely give Movavi Slideshow Maker a go. It is a slideshow maker program that has a unique approach and will let you easily compile a slideshow replete with numerous different types of audiovisual elements to give it a bigger impact. Right from the start you’ll be able to see just how simple and easy it is to compile a slideshow with Movavi Slideshow Maker. In fact it even has its very own ‘Easy mode’ that will let you create slideshows with background music as well as animated transitions in 3 simple steps. Aside from the ‘Easy mode’ there is the ‘Full feature mode’ of Movavi Slideshow Maker, that really isn’t that difficult to use either. It has a clean timeline-based interface that will let you easily navigate and find the features that you want to apply to your slideshow. 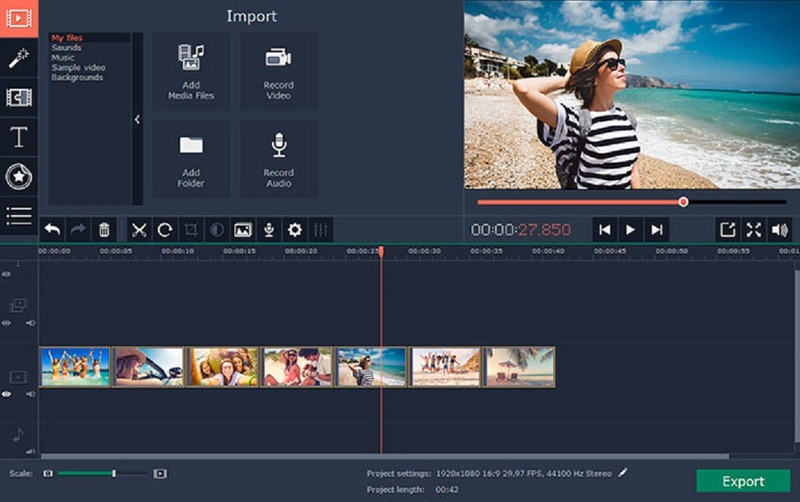 Overall Movavi Slideshow Maker is designed to be intuitive, and uses basic and familiar actions for all of its features. Because of that you shouldn’t have any problem figuring out how they work, and it should only take a minute or two to do so. Incorporate video footage alongside images as part of your slideshow. Select and add specific animated transitions between individual slides. Insert multiple audio tracks containing background music, a voiceover or other audio. Edit audio tracks to improve their quality, remove unwanted background noise, apply audio effects, and more. Enhance the quality of videos and images that are part of your slideshow. Apply artistic filters to give your slideshow a unique visual style. Place text elements in the slideshow and customize their appearance to create subtitles, bullet points, titles, or captions. Take advantage of a library full of built-in media, including images, background music, or video footage. As you can see the features in Movavi Slideshow Maker will more than equip you with what you need to create impressive slideshows from scratch. If you want to quickly come up with a decent slideshow you can always use its ‘Easy mode’, whereas if you would like to be able to fully customize and perfect it then the ‘Full feature mode’ may be more suited to the task. In either case it shouldn’t take you long to create a slideshow that really lives up to your expectations and has exactly the look and feel that you want it to.